Mizuno YOUNG GUNS ELITE Camp (Born in ’05 and ’06) August 12th to 18th More INFO! 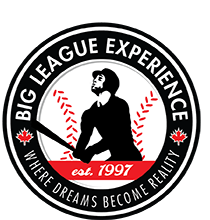 The newest Big League Experience camp, the Mizuno YOUNG GUNS ELITE 12/13 runs August 12 to 18 in Oliver, B.C. and is designed for players who are advanced 1st year Peewees (heading into 2nd yr) and 2nd year Peewees (heading into Bantam) that may need more work before the transition. Players would be born in 2005 and 2006. Campers will Play on a 70 ft/50 ft diamond with the stronger players getting the opportunity to progress and play on a Bantam sized field – 80 ft/54 ft diamond. Throughout the week campers will receive in-depth skill development through individual specialty stations, intrasquad and tournament games. Team strategy and positional play will also be a big part of the daily schedule. Individual and team awards are acknowledged on final day of camp. Cost of the camp, including lodging, meals, camp hat/shirt/shorts, coaching and supervision will be $795 plus GST.